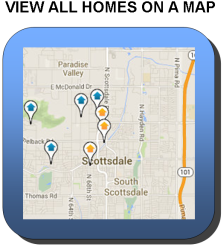 From here, you can easily browse all available Scottsdale waterfront homes, condos and townhomes from the Arizona MLS. Our real estate listings are updated daily, giving you the most current and up-to-date information available. To get started, simply click on your choice of the buttons below to view a list of all homes for sale, or to view listings on a map. 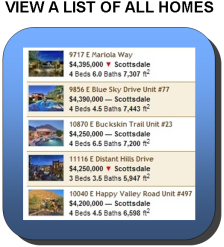 Scottsdale waterfront homes, condominiums, townhomes and patio homes account for approximately .02% of the total number of Scottsdale listings available for sale in the MLS. While scarce, opportunities to purchase these property types do exist. As is true in other parts of the country, waterfront homes, and those simply with a view of the water command a premium. A 25% or more increase in sales price can be expected when buying a waterfront home, compared to a similar home, in the same subdivision, not located on the water. None of the lakes in Scottsdale are suitable for activities such as water skiing, wake boarding or jet skis. If that's what you're looking to do, you will have to head out to one of our fabulous lakes on the outskirts of town such as Lake Pleasant, Saguaro Lake, Canyon Lake, Apache Lake or Roosevelt Lake. Several of the lakes offer various moorage options as well as See-Doo, jet ski and boat rentals. The vessel of choice for homeowners with lakefront property in Scottsdale are pontoon boats. Not only are they great for fishing, pontoon boats are ideal for cruising around the lake with friends and family. 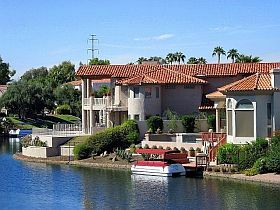 The two most desirable locations for those looking for a lakefront home in Scottsdale are Lake Serena at Scottsdale Ranch, and Lake Margherite at McCormick Ranch. Both are centrally located, close to shopping, restaurants, nightlife, freeways and health care.